Your step-by-step guide to & from the TGV station Aéroport Charles de Gaulle 2. – After disembarking, follow the indications "Exit". – Exit the terminal, turn on your right hand side. – Walk on the pedestrian pathway. – Take the pedestrian tunnel. – At the end of the tunnel, cross the road safely (press the button to activate the walk signal). – Keep on going the pedestrian pathway. 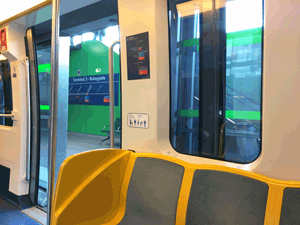 – Go through the automatic doors, you are entering the RER station lobby. – Follow the indications "CDGVAL-Terminal 2-Main lines", towards the left. – Head to the CDGVAL station. – Follow ″Terminal 2″, take the escalator down, on your right. – Get on the CDGVAL automatic shuttle train. If you need information about CDGVAL, click here! – Get off the CDGVAL at station ″Terminal 2″ (last stop). – At the end of the platform, take the escalator up. – Upstairs, turn right, follow the indication ″Trains″. – You are entering the lobby of the TGV-RER railway station. – At lower level, follow the directions towards TGV (Main lines). – On the mezzanine, check your flight information. – Take the escalator up towards terminals 1, 2B, 2D, 2F, 2G, 3. – Upstairs, in the lobby, follow the signs ″Terminal 3-CDGVAL″, to the right. – Take the escalator down to the CDGVAL station. – Get on the CDGVAL shuttle train. – Get off the CDGVAL at station ″Terminal 3 - Roissypole″ (2nd stop). – Exit the station, turn right, follow the indication "Terminal 3". – In the lobby, follow the signs for "Terminal 3". – Exit the station, go through the automatic doors. – Cross the road safely (press the button to activate the walk signal). – You are nearby terminal 3. – Departures hall (on your left hand side) or Arrivals hall (keep going straight).